Monhegan is about half-a-mile wide and a mile-and-a-half long - ten miles off the mid-Maine coast. The small village, of 100 houses, is home to approximately sixty year-round residents. 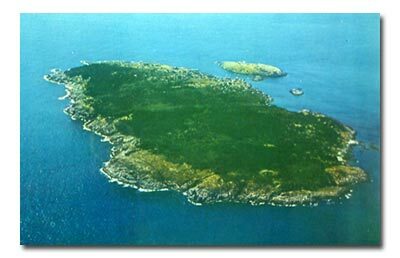 Most of the Island remains in its natural state, with some seventeen miles of hiking trails leading, through spruce and fir forest and over granite ledges, to cliffs rising 150 - 160 feet above the north Atlantic. Monhegan is a starkly isolated place, which has become a haven for those who appreciate its natural wild beauty. In the summer, ferry dockings, restaurants, artists' studios, the Museum and the Library all contribute a modest activity to the village. In the fall and spring, Monhegan approaches the essential character it reaches in winter - a fishing village, a respite for birds along the Atlantic Flyway, an island remote from the city, in the midst of the elements. Walking from the dock to Tribler takes about five minutes. Follow the road that leaves the Wharf; walk up and over the top of Wharf Hill to the intersection with the Main Road. There, at the entrance to the Lupine Gallery, turn left. After you turn, the Monhegan Library will be just ahead of you on the right (with white Adirondack chairs outside). Turn right on the road just beyond the Library. Tribler Cottage will be about a hundred yards ahead of you on the left. Follow the flagstone path to the front door. Several restaurants are open from mid-May until mid-October. There is a small grocery store. 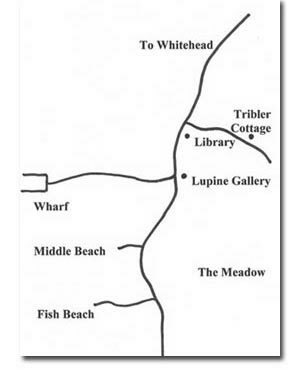 The Lupine gallery and artists' studios are open in season. Public telephones require a credit card, a collect call, or billing to a third party. Windbreakers, raingear, good walking shoes, and a flashlight could all make your stay more enjoyable.